During the International Spiritual Exercises, at Collevalenza – Sanctuary of Merciful Love (Madre Speranza), 21-27, 2015, Père Laurent Larroque offered to over 200 priests and to over 10 bishops of the Marian Movement of Priests these words in a meditation. This morning (http://spir-food.blogspot.it/2015/11/attack-on-eucharist.html) I spoke of the four attacks identified by Don Stefano against Jesus in the Eucharist: against the faith in His Real Presence, and therefore against adoration and against the attention toward the tabernacle; then the many communions without the state of grace, which are sacrileges, and finally the attack on the sacrificial dimension of the Mass, which will bring the '"abomination of desolation" in the holy temple of God, as foretold by the Holy Scriptures, when dealing with the end times. All this must happen before the return of Jesus in glory to establish His Kingdom, which will also be a Eucharistic reign over all the earth, "the new heavens and the new earth". Before talking about adoration and this our invincible hope in the ultimate triumph of Jesus and Mary, I return to the last point: the attack on the sacrificial character of the Mass. Our book says that this develops as a progressive protestantization of the Mass. And to understand well what is behind this concept of "protestantization", we must review this fact in the more general philosophical context. Maria, in her Book (cfr. The message of 17 June 1989 regarding "666") says that the philosophers, with scientism and rationalism (that is, giving exclusive value or at least exaggeration of science and of human reason) have provoked a whole historical process of thinking which has led to our modern mentality. And Mary sees that Protestantism, with its principles, that of "Scripture alone" (ie, denying the value of the Magisterium and Tradition as fundamental to the faith) and that of the "free will" (ie: that is - as Mary says - "everyone is free to read and to understand Sacred Scripture according to his own personal interpretation"), has become an instrument of this rationalism, which led - as I said in my first meditation - subjectivism and relativism: that is, to claim that there is no objective truth, there is no absolute truth on this earth; and therefore, there is no objective revelation of God, and above all, there is no possibility to know Jesus through the subjectivity of the early Church (and even more: Matthew, Mark, Luke and John, are considered to be of unknown authors this early Church, as sick people of our subjectivism, that is incapable of recounting the truth that they had seen and heard about Jesus). "This situation, having penetrated deeply into the collective consciousness of Christianity [it has penetrated especially in many seminary professors, and therefore in many seminarians] is dramatic for the faith," said Benedict XVI in his Introduction (Preamble) to his "Jesus of Nazareth" . In regards to this, I love to remember the phrase of Jesus at the end of his public ministry in the Gospel of John (12:48): "He who rejects me and does not receive my sayings has a judge; the word that I have spoken will be his judge on the last day". Are we not to judge the Word of Jesus: it is the Word of Jesus that judges us and which will judge us on the last day, that we believed or that we doubted in our lives. Then, of course, if you do not know anything for sure about Jesus and about his Words and actions - as many big professors say today and as are written many official introductions to the Gospels in our Bibles - then it is obvious that the Eucharist can no longer be a mystery to be believed with the joyous absolute certainty of faith. And yet, "nil hoc verbo veritatis verius ..."
“Totalitarianism arises out of a denial of truth in the objective sense. If there is no transcendent truth, in obedience to which man achieves his full identity, then there is no sure principle for guaranteeing just relations between people. (…) If one does not acknowledge transcendent truth, then the force of power takes over, and each person tends to make full use of the means at his disposal in order to impose his own interests or his own opinion, with no regard for the rights of others. People are then respected only to the extent that they can be exploited for selfish ends. Thus, the root of modern totalitarianism is to be found in the denial of the transcendent dignity of the human person who, as the visible image of the invisible God…” (Centesimus Annus 44: Cfr. Veritatis Splendor 99, and CCC 2244). “Humanity today offers us a truly alarming spectacle, if we consider not only how extensively attacks on life are spreading but also their unheard-of numerical proportion, and the fact that they receive widespread and powerful support from a broad consensus on the part of society, from widespread legal approval and the involvement of certain sectors of health-care personnel. As I emphatically stated at Denver, on the occasion of the Eighth World Youth Day, "with time the threats against life have not grown weaker. They are taking on vast proportions. They are not only threats coming from the outside, from the forces of nature or the ‘Cains' who kill the ‘Abels'; no, they are scientifically and systematically programmed threats. The twentieth century will have been an era of massive attacks on life, an endless series of wars and a continual taking of innocent human life. False prophets and false teachers have had the greatest success. … We are in fact faced by an objective "conspiracy against life".” (Evangelium Vitae 17). “Why do the nations conspire, and the peoples plot in vain? The kings of the earth set themselves, and the rulers take counsel together, against the LORD and his anointed (that is, Jesus), saying, "Let us burst their bonds asunder, and cast their cords from us." Our Lady talks about the attempt to form a kind of universal brotherhood, of a world religion, at a time when Pope John Paul II brought together different religions at Assisi, to pray for peace, what was later called "the spirit of Assisi." Maria says: pray for Peace, yes! But also go to preach the Gospel, because "there is no other name given to men" to be saved but only the Name of Jesus Christ. This assertion of St. Peter (Acts 4:12), we must say with the courage of the martyrs before the modern Sanhedrin of the dictatorship of relativism, which tells us, "We strictly charged you not to teach in this name, yet here you have filled Jerusalem with your teaching and you intend to bring this man's blood upon us!" (Acts 5:28). In the great fraternal universal assembly, there are the Buddhists, Muslims, Protestants, the Catholic mass no longer Catholic, and there is the small remnant of "resistant" Catholics targeted by the modern Sanhedrin, because this small remnant does not believe in this universal fraternity which is created at the price of the Truth of Jesus (cf. CCC 675), the only Name given to men to be saved. It will be a small remnant, the "little flock" which must not fear, says Jesus, because the Father has been pleased to give to them the Kingdom ... (Luke 12:32). That is, we have a great responsibility before Jesus, in the Name of Mary, we, of the M.M.P. : we are the ones told to respond to the doubt of Jesus: "When the Son of man comes, will he find faith on earth?" (Lk 18:8): with Mary, through Mary, thanks to Mary and to HER Movement, there will this small faithful remnant, all guarded in her Immaculate Heart, by way of its lived Consecration, that will be able to respond: "yes, Jesus, we are here that we have been waiting for You!" It will be a moment of indescribable joy after so many trials. Often the dictatorship of this pharisaic Sanhedrin, having entered even in the Church, stones the priests who clearly speak out about the truth of the Catholic faith and about the morals of the Ten Commandments, accusing them of being too conservative, too rigid, too closed to progress, to ecumenism, to be hardliners, at least fundamentalists and traditionalists. With the Holy Spirit, our Divine Counselor and defender against the Accuser, we still want to repeat before the whole world, opposing the reigning relativism: "This Jesus is the stone rejected by you the builders [i.e. the Freemasons of a new world order placing Jesus, the Cornerstone, to the side], He has become the cornerstone. In no one else is there salvation; there is no other name given among men under heaven by which we must be saved" (Acts 4:11-12). And we will probably also be condemned by this Sanhedrin as enemies of the great universal brotherhood, esteemed to be "of ecumenical spirit", which will be formed behind the antichrist. “Why do you pass judgment on your brother? Or you, why do you despise your brother? For we shall all stand before the judgment seat of God; for it is written, "As I live, says the Lord, every knee shall bow to me, and every tongue shall give praise to God." So each of us shall give account of himself to God. Then let us no more pass judgment on one another, but rather decide never to put a stumbling block or hindrance in the way of a brother. We who are strong ought to bear with the failings of the weak, and not to please ourselves; let each of us please his neighbor for his good, to edify him. For Christ did not please himself; but, as it is written, "The reproaches of those who reproached thee fell on me” (Rom 14:10-13; 15:1-3). I think it will be better to endure in silence the insults of those who "expel us from the synagogues" and will drag our name through the mire thinking they are offering service to God (cfr. Jn 16:2-3), while we will not deserve anything of all these things. Let us remember what Our Lady had specifically asked Don Stefano: "pray, suffer, offer, be silent". Live the three theological virtues. Life the faith in Jesus and the commandments of God (cfr. Rev 12:17). Nothing could be simpler. But nothing more difficult in our time. For this reason, those who do not consecrate themselves and live their consecration to the Immaculate Heart of Mary, will not resist in front of the strong current of apostasy and general rebellion against God and His Christ. So, I began again from the message of June 17, 1989, to go to the roots of our modern ills, which will bloom into the mystery of the Antichrist: Rationalism, Protestantism, subjectivism, relativism, liberalism and false ecumenism, and all this will blossom into the greatest global and absolute totalitarianism of history, under the guidance of the false prophet par excellence, the Antichrist himself. I repeat that I do not know who he is, and I do not want to name names. And a mystery before of which it is better to say "I do not see, and I humbly ask the light, more light," instead of saying "I see and I condemn." That said, I sincerely think that everything is ready now for the appearance in our world of this figure of the false prophet par excellence, as Rev 13:11 calls him, or better, seeing the antichrist as a figure like a lamb. And I want to speak here especially about focal point of all this deceit, which will be the APOSTASY OF THE TRUTH: Jesus in the Eucharist. Thus I return to my starting point (the message of December 31, 1992, "the fourth sign of the end times. The abomination of desolation"): what does it means, in this secular sphere , "epochal" as Father Ivan said, the "protestantization the Mass"? 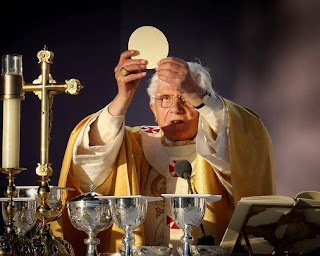 The protestantization progressive of the Mass is a way to reduce the mass to the remembrance of the Lord's Supper on Holy Thursday, as do the Protestants, without any dimension of Good Friday. Now the Mass is the great mystery that includes the whole Passover of the Lord, not only the memory of the institution of the Eucharist. "O sacrum convivium, the Church sings with this anthem composed by St. Thomas Aquinas, o sacrum convivium in quo Christus sumitur; recolitur memoriae passionis ejus; mens impletur gratiae; futurae gloriae nobis pignus datur" O sacred banquet, in which assimilates the Christ, it makes memory of his passion (past); our spirit is filled with grace (present); and there is the pledge, the first fruits of future glory (future). Or still, as we say after the Consecration, adoring and acclaiming Jesus here really present: "It is great, the mystery of faith! We proclaim your death (the past), o Jesus, we celebrate your resurrection (present), waiting until for your second coming in glory (future): this distinction between past, present, and future is only for our human understanding, because in fact, in the mystery of the Eucharist, there is the whole mystery of Easter, the whole past of the Sacrifice, all the grace of the Resurrection, and all the glory to come one day, everything is present in the mystery that is here before us: in reality, there is no past or future, the whole Christ is here before us. All the Mystery of God is present in the mystery of Christ; and the whole mystery of Christ is present in his Eucharist, his entire life in all his mysteries (this is why we celebrate mass for Christmas as for Easter as for all the moments of the liturgical year), his whole death on the cross is present, his whole resurrection, and all of his future glory, although still hidden from our eyes. “This is the hour of Satan and of his great power. It is the hour of darkness! (…) How many of these poor sons of mine are even now abandoning the Church, either criticizing and challenging her, or even going so far as to betray her and deliver her into the hands of her Adversary! ‘Is it with a kiss, Judas, that you betray the Son of Man?’ (Lk 22:48). Even you, today, are betraying with a kiss the Church, the Daughter of your heavenly Mother! You still belong to her, and you live for her; you exercise her ministries, and you are often even her pastors. Each day you renew the Eucharistic Sacrifice, administer the sacraments, and proclaim her message of salvation. And yet some of you are selling her to her Adversary and striking her to the heart by corruption the truth with error, by justifying sin and living according to the spirit of the world, which thus through you enters into her interior, threatening her very life. Yes, with a kiss, you, my very own poor sons, are again today betraying my Church and delivering her over into the hands of her enemies. And so she too WILL SOON BE DRAGGED BY YOU BEFORE HIM WHO WILL DO ALL HE CAN TO EXTERMINATE HER. She will once again be condemned and persecuted. She will again have to shed her blood. What light? The light of truth of the Gospels. In the midst of a schism that has become universal, in the general swing away from the truth of the faith, it is enough to remain Catholics. With the "patience of the saints," as Rev 14:12 – taking up again Rev 12:17, namely the conclusion of Revelation 12, which describes the great struggle between the Woman clothed with the sun and the Red Dragon – IT IS ENOUGTH TO KEEP THE TEN COMMANDMENTS AND FAITH IN JESUS. In the Book of Revelation (Rev 12:17) this is called "to bear testimony to Jesus", because it is to possess within us the Holy Spirit, whom Jesus calls the "Spirit of Truth", because he testifies the Truth of Jesus, Jesus-Truth within us. It is not a human opinion, and that's why nobody can intimidate us with insults of "intolerant person" or "fundamentalist" if we continue to say that Jesus in the Eucharist is an absolute truth before which all men and all angels must bend their knee. In these troubled times, in which Satan rules with all of his dark power of an apparent lamb, which is only a mask behind, behind which the greatest wolf in all of history will do everything in order to destroy the Church. On the pretext of entering into a greater fellowship with our separated Protestants brothers, under the nice pretext of ecumenism, one can arrive to the horrible sacrilege, to deny the Real Presence of Jesus in his own Church, to throw out the Cornerstone that God has placed and that no one can allow himself to discard (1Cor 3:11), and above all, to mix the Catholic Mass with the Protestant supper, in such a way that the true Sacrifice of Jesus will disappear. The Sacrifice of Jesus, renewed on the altar, is what still holds back a little the great power of Satan on this earth. Mary often repeats to us that the holy Mass has a great power to apply the mystery of the Redemption, to purify again an infinite mass of sins, and to give again always many outpourings of grace from the Most Holy Trinity. But from the moment of the more or less total abolition of the Sacrifice of the Catholic Mass, then there will no longer be, for a time, anything that prevents Satan to act on this world to reduce it in his dark power. “… For a short while, the Lord will permit that the Church will be as though abandoned by Him.” (Cf: February 10, 1978; December 19, 1973; February 23, 1974; October 18, 1975; December 8, 1980) but we are not afraid, because this is part of the mysterious plan of God, like the Cross. Then, we are afraid, because this terrible moment will not last long. Three and a half years, say the Scriptures, which Mary tells us to take literally in this message of December 31, 1992. Then, let us not fear, because Mary tells us that the more times will become decisive, strong, tough, dark, the more She will be present, even in an extraordinary way, to show us the way. IN THE MEANTIME, WHAT MUST WE DO? “And since this is the hour of your purification, it is above all the hour of your suffering. Trust, prayer, suffering, offering, silence, waiting adoring the Eucharistic glorification of Jesus in His presence Real, which will leave us all full of heavenly awe and amazement of this permanent and visible miracle visible to everyone, to the point of renewing the structures of the world , forming a new heaven and a new earth.